InWorldz have issued details of their kick-off rally to mark the start of their 2013 Relay for Life of InWorldz season in aid of the American Cancer Society. 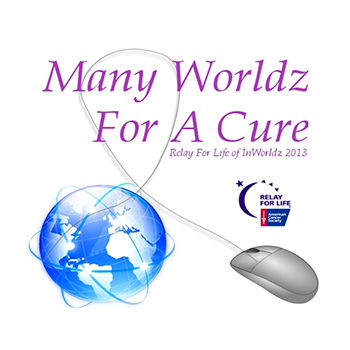 InWorldz community members are uniting at a rally to officially launch their Second Relay For Life season of Many Worldz For A Cure. Hundreds of participants again are will ringing in the new season with a rally that educates everyone on how their involvement benefits the American Cancer Society’s goal to save lives and create more birthdays. Money raised will fight cancer by helping people stay well and get well, by finding cures, and by fighting back. Come join us, as we meet the American Cancer Society organizing committee and a live performance by Russell Eponym. Come rally with us to begin a campaign we will not lose. According to the RFL of IW website, sponsorships for the season are currently open, and comprise three levels, starting at $50.00 USD and rising to $150.00, each with unique benefits to sponsors, including website promotion, event mentions, logo promotions, and more. For full details of each level of sponsorship, the levels still available, and how to become a sponsor, please refer to the RFL of IW sponsorship page. Relay For Life (RFL) is an inspirational overnight fundraising event that honours cancer survivors and celebrates life. Each Relay is a community-led, non-athletic event where teams fundraise and then join together in the Relay event. There, teams take it in turns to walk round a track for up to 24 hours to signify that ‘cancer never sleeps’. RFL started in the United States in 1985 when one man circled around a track for 24 hours raising $27,000. Now, over four million people from twenty countries world-wide participate annually in Relay for Life events. RFL of IW is officially sanctioned by the American Cancer Society and a recognised RFL event. Previous Post Sun, sand and Shakespeare – it’s Bard on the Virtual Beach 2013!